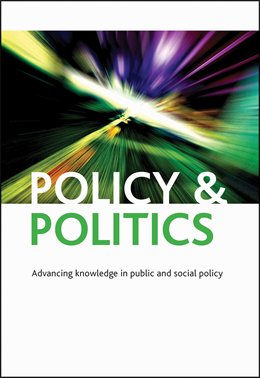 We are delighted to announce that Policy & Politics has achieved an impressive result in this year’s Journal Citation Reports with an Impact Factor of 1.939. This places the Journal firmly in the top quartile of international journals in both the public administration and the political science categories. This fantastic outcome is testimony to the outstanding quality of research produced by our authors, the meticulous scrutiny of our peer reviewers, and the hard work of the Policy & Politics and Policy Press team. We would like to offer our thanks and congratulations to all. Depoliticisation as process, governance as practice: what did the ‘first wave’ get wrong and do we need a ‘second wave’ to put it right? Governing at arm’s length: eroding or enhancing democracy?